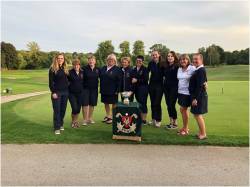 After a fantastic season the Leicestershire & Rutland Ladies County 2nd team won their division beating Nottinghamshire and Lincolnshire to secure a place in the Midlands North Regional Final against the reigning champions, Derbyshire. 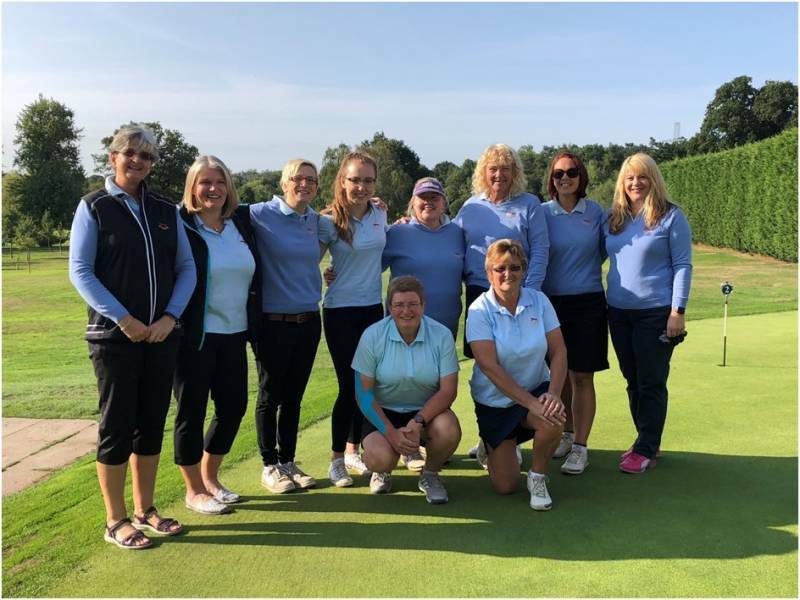 Not only had we qualified, we were also the host county and had the honour of organising the event at Rothley Park Golf Club on Thursday 30th August. 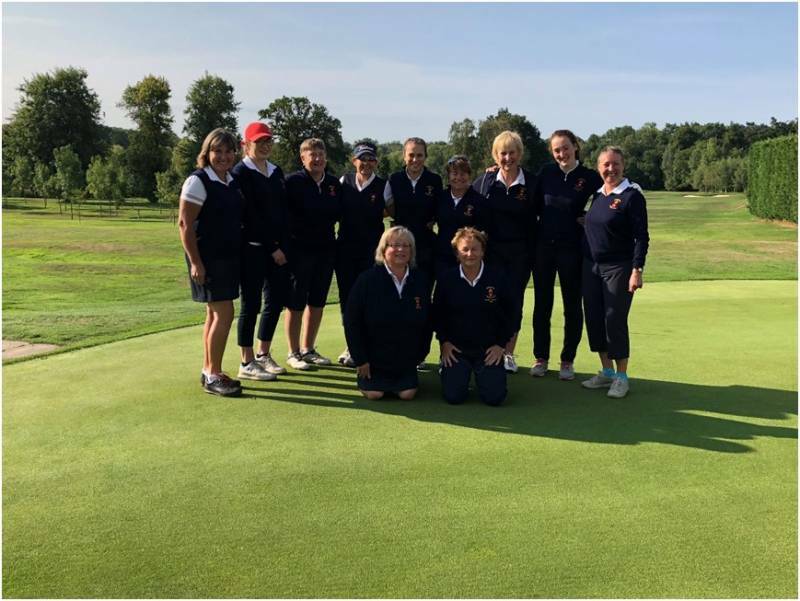 Prior to the event the L&RLCGA Committee, the ladies section and the club manager Danny Spillane at Rothley Park GC had worked extremely hard behind the scenes to ensure that everything was in place and that the competition would run smoothly. 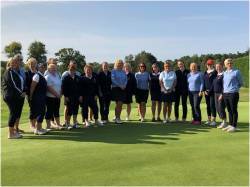 Both teams arrived at Rothley Park bright and early where we were greeted with a warm welcome from Caroline Simpson (L&RLCGA Competition Secretary and Rothley Park’s Lady Vice-Captain). The sun was shining and all the competitors were in high spirits, Rachel East and Janet Carlin the two captains exchanged their team lists and the morning foursomes were announced on the first tee by the Leicestershire & Rutland County President Moira Page. All Three matches swiftly got underway. Once all three groups had reached the half-way house on the twelfth which was superbly managed on the day by the ladies’ section at Rothley. Suppling tea, coffee, homemade cakes and biscuits for all the players, caddies, spectators and supporters. All of the matches were in Derbyshire’s favour, we were down in all three matches. 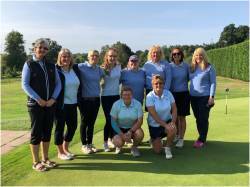 Clare Bailey and Katie Underwood (Birstall) finished first losing 6/5, Sue Holwell and Barbara Suffolk (Lingdale) played some excellent golf but unfortunately lost on the 17th hole 2/1. 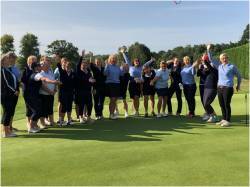 Our last pairing of Karen Bonser (Willesley Park) and Rachel East (Cosby) had been 3 down standing on the 15th tee and they dug very deep and managed to sink some excellent long putts to keep the game alive, they won 15, won 16, halved 17 and won 18 to secure a halve. After the morning session Leicestershire & Rutland scored 0.5 and Derbyshire scored 2.5. We knew that we had a tough challenge ahead in the afternoon but we were all prepared for the fight back and to play our very best golf in the singles. The team got off to a flying start, at the half way point in the afternoon it was a totally different story and Leicestershire & Rutland were up in nearly all of the singles matches, you could feel the positivity bussing across the course, we were very fortunate to be playing at home and therefore we had a tremendous amount of support behind our squad which was infectious. 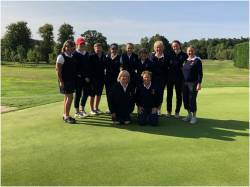 Match number one finished on the 17th, Barbara Suffolk (Lingdale) won 3/1, closely followed by Olivia Barrs (Lingdale) who won 1up on the last. The scores were now even Leicestershire &Rutland 2.5 and Derbyshire 2.5. Match number three, Rachel East (Cosby) secured her win on the 17th winning 3/1, which took Leicestershire & Rutland into the lead for the first time. Match number four, Karen Bonser played some great golf but unfortunately lost on the 17th 3/1. Once again the scores were tied with two matches left on the course. 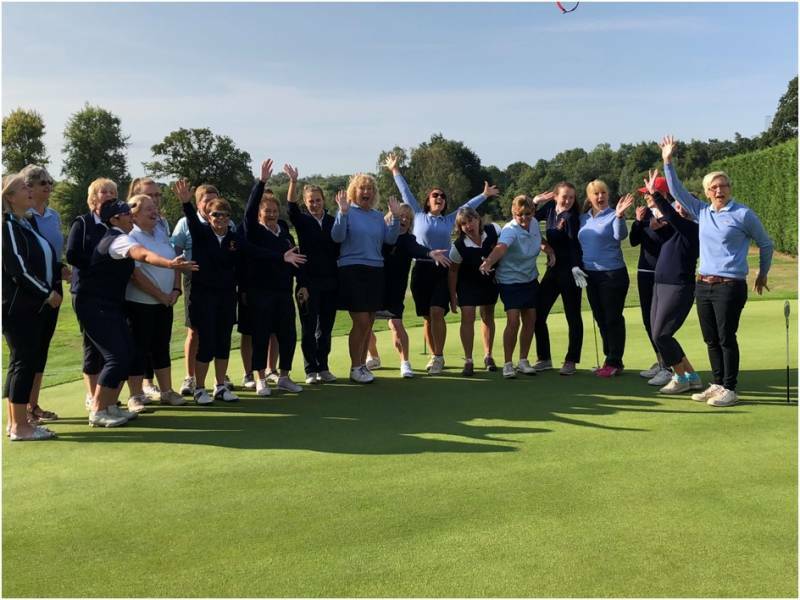 Both matches were incredibly tight and the game was becoming increasingly more exciting, Katie Underwood was 1 down standing on the 16th tee and Sue Holwell was 1 up standing on the 16th tee, it could not have been any closer. Sue Holwell fought hard over the last few holes and teed off on the 18th all square, both Sue and the Derbyshire lady Deb Egalefield had very tough putts on the last green, where the pin was in a difficult position, both players missed their putt and halved the hole so the match was still all square. Katie Underwood had played some excellent golf over the last three holes, however she entered the last hole 1 down, however she made a regulation 5 which was enough to win the hole and get a half. The final score was Leicestershire & Rutland 4.5 and Derbyshire 4.5. In the event of a tie the game is determine by the number of holes won and lost in each match. Unfortunately, we just missed out 7-11 to Derbyshire. The whole day was fantastic, every match was played in good spirit, both teams were supportive of one another. 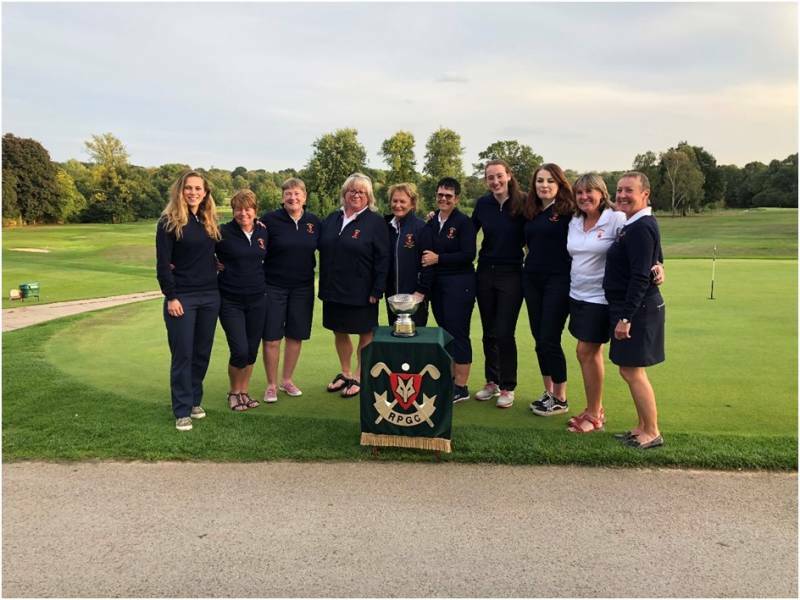 Rothley Park Golf Club were superb hosts, the greens were in excellent condition, the food was delicious and well organised, the staff were very friendly and accommodating and the ladies section were invaluable. All of the players were united as a team, passionate and enthusiastic to the end. A huge thank you to all of the people who came to support the final, it was lovely to see so much blue on the course. Thank you to Keith Jones our very knowledgeable referee, Peggy Remington our Midland North Representative, Caroline Simpson our competition secretary and Moira Page our County President for all your support and hard work behind the scenes.